Pamela Wheaton Shorr, editor of The Heller Reports’ Educational Sales and Marketing Insider, contributed a piece for the recent Scholastic Administrators, Take Control of Tech. The abstract reads..
Schools across the country are waging a war against technology tools gone bad. Read how some districts defend their classrooms against the new school thuggeryâ€”from iPod cheats to cell phone punks and sneaky Web surfers. After some reasonable advice from Will Richardson, the author goes on to describe “horror stories” that include inappropriate uses of mobile phones, digital cameras, digital cameras on mobile phones, MySpace, poorly filtered school networks, and MP3 players. Absolutely nothing new here. It’s an old story. OK, so our kids are connected. But it isn’t the technology that they connect to. It’s the information. We often talk about how small the world has become. But on a personal level, our children’s world is probably larger than for any generation of youngsters ever. They are accustomed to commanding a global digital library, mixing selected content and publishing it on their social networking sites, in collaboration with or for the benefit of friends who may well live on other continents — though that is not always clear, as the geography really doesn’t seem to mean much to them. It is almost as if our children are a new species, with info-tentacles, reaching out to connect their gigantic world through their cell phones, IM, massively multi-player online role playing games (MMORPG), social networks, text messaging, and their MP3 players. They’ve spent the summer with open access to each other, open access to content, open access to schedules as they practice their weird rhythm of working until four in the morning and then sleeping until 1:00 PM. No limits. Now they are returning to school, which is almost entirely about limits. We contain them in classrooms. We contain them with schedules. We contain their access to each other — “No talking!” We contain content inside the covers of textbooks and the walls of libraries, and when we give them access to the Internet, it is so highly filtered that even teachers are frustrated by the valuable content and applications that are blocked. rather than teaching the children that they are. I know that this is not simple. I know that neither we nor our children are ready to open it all up. We need time to work it through. 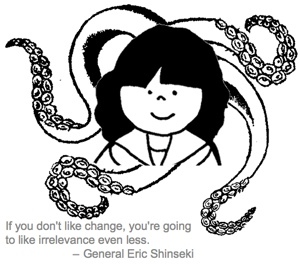 We need to figure out how to channel valuable learning through our children’s tentacles. But I suspect that within the next five years, our children are going to have every reason to expect to walk into their classrooms with their iPods, their handheld computers, their cell phones, and their laptops — that limiting their access to information will seem almost unpatriotic. We have only a few years to figure out how to channel learning and what kinds of questions to ask, when our children are bringing Google with them to take their tests. The more that we try to contain the learning experience, the more our classrooms will leak!